The five-star Hotel Metropole isn't quite as well-known to outsiders as the Hotel Danieli (which is just down the Riva degli Schiavoni from the Metropole, toward St. Mark's Square), but it has a following among well-heeled Venetophiles--and especially among guests who appreciate the Metropole's illustrious history, its museum-grade collection of objets-d'art, and the Michelin two-star Met Restaurant. Walk a few more meters beyond the Pietà church, and you'll see the Hotel Metropole on your left. 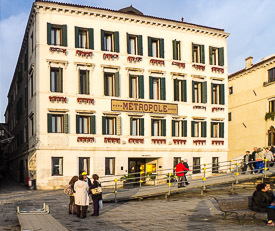 Cross the stone bridge and walk past the Locanda Vivaldi and the Pietà church to the Hotel Metropole.